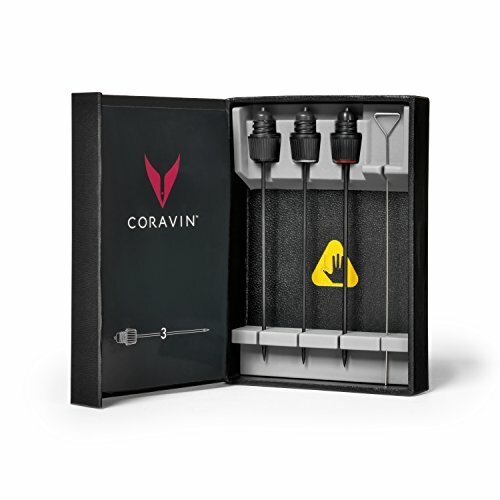 The Coravin Needle Kit contains a selection of wine needles designed for the Coravin Wine System, to ensure you are prepared for any bottle or situation. The kit includes a Coravin Vintage Needle, A Coravin Fast Pour Needle, a Coravin Standard Needle and a needle clearing tool. The Vintage Cork needle is a thinner needle and is designed for the older vintage bottles in your collection that may have a fragile cork. The Faster Pour needle has a wider diameter and is designed to provide a quick pour (about 24% faster than the standard needle) from bottles with corks that are in good condition. The Standard Needle is a replacement needle for what was initially included with the Coravin System. All Coravin wine needles are stainless steel and special coated, providing durability and easy insertion over hundreds of pours.